Ride with us and welcome spring with a free guided art bicycle tour along MoreArt 2014! 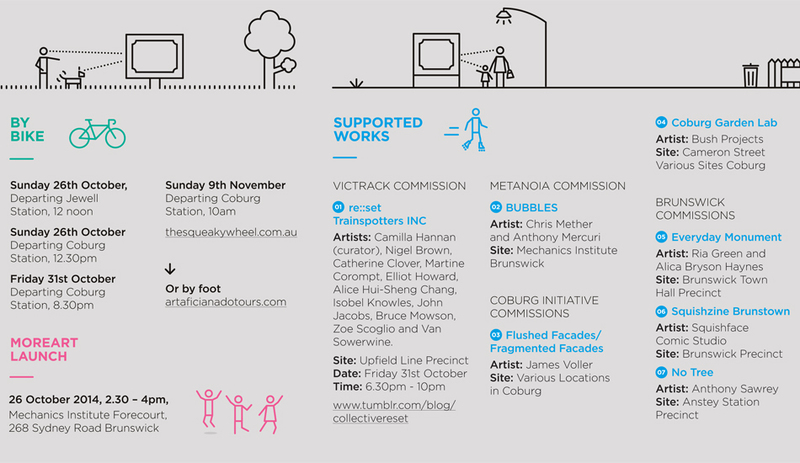 MoreArt, now in it's 5th year, is annually transforming the area around the Upfield train line into public art space, this time with over 18 commissioned works to discover, discuss and appreciate, running from 26 Oct - 19 Dec. In our 2.5hr bike tour, we are taking in all artworks of this year's show with Art Aficionados Jane O'Neill as host and participating artists on hand to discuss their works on site. Celebrate the day and the beginning of the outdoor season and stick around for nibbles, drinks and tunes at the official MoreArt launch party & award ceremony at Mechanics Institute Brunswick afterwards. This tour is appropriate for confident riders and will take place mainly on off road bike lanes (Upfield bike path) - some riding on on-road bike lanes required. Bring some water, sunscreen and snacks, places limited to 22 participants.